There's an old saying, "Be careful what you wish for, you just might get it!" Boy did I find this out first hand in a big way in 2003. That is when I met a beautiful dark bay Quarter Horse colt belonging to a friend of my husband and put me on a path that would forever change my life…and my career. Little did I know that this horse was bipolar in every sense of the word. All I knew is that he was gorgeous and I wanted to have him. From this one horse I learned the importance of never assuming that a horse is always left or right brained all the time, but may change depending on the circumstances and its environment. I learned the importance of patience and that earning trust goes both ways. We had just found out that the lovely older Arabian mare that we had gotten for my daughter as her first horse had cancer in her lymph nodes. A devastating diagnosis for a little 8-year-old girl. A friend of my husband raises cutting horses and he had a homely little orphaned unregisterable dun colt who lost his dam to cancer. He felt very bad when he heard about our daughter's mare and offered the colt to us along with another really pretty dark bay (almost black) AQHA registered colt. I always wanted a black horse having grown up reading every book in The Black Stallion series from cover to cover multiple times! I jumped on the offer. It was like a wish come true and it seemed like such a great deal. Well, it wasn't! 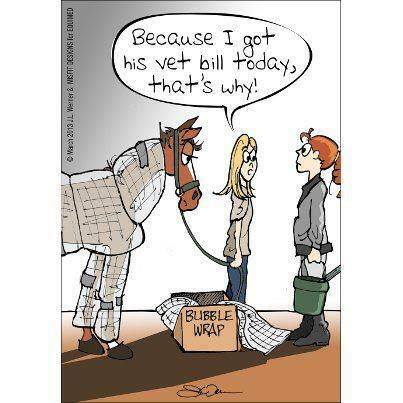 There's no such thing as dirt cheap in the horse world! So funny how things work out. Serendipity at it's finest. And now the fun begins! I can tell you honestly, my husband and I had no business getting two young untrained horses. Our previous experience had been taking care of and riding our friends' already trained horses and our own VERY experienced older Arabian mares. We had our work cut out for us because we couldn't even get near the dun, which my daughter of course named "Spirit", and the bay ("Tex") seemed at first very docile and was easily caught but soon proved himself to be very dominant and extremely dangerous! "Tex" proved to be a very left-brained introvert most of the time. Pinning his ears when asked to do anything he didn't want to, sluggish to move – we couldn't even get him to trot a circle for more than a couple of steps. He even bit my daughter on the nose and my husband on the back. I started looking into the Parelli program which my farrier recommended. 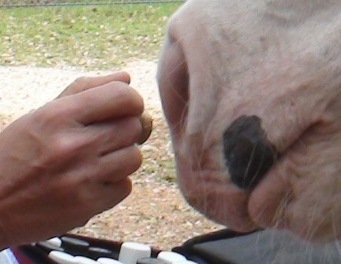 Over time I learned to earn his respect on the ground as I worked through the Parelli program, and most of the serious behavioral problems like biting and charging completely stopped. He seemed very brave when we would take him to different places, very laid back and not bothered by much. I could easily bounce the big green ball off his back, hold an umbrella over his head, put tarps on him. For all intents and purposes he was going to make a great trail horse when we got him started under saddle. NOT! It turned out he was a bucker. And not just a kick up your heels a couple of times and I'm done bucker, but a wild-eyed, lights are out and nobody's home kind of bucker! But he was only like this when the saddle was on. And mind you, I didn't start him under saddle. He was started by a professional trainer, albeit not a Parelli trainer. Everyone kept telling me the same thing, "don't let that horse win", "show 'em who's boss! ", "just keep pushing him through the buck, it'll get better". But it didn't get better, it got worse. I sent him to multiple trainers over the years to try and work out the problem, but even after months and months with professionals and thousands of dollars later, it just kept cropping up. It wasn't until I sent him to Chris Ruthven of C&C Colt Company that we finally started to get an idea of what was going on with "Tex". Chris noticed that after he saddled up "Tex" to ride, rather than immediately going to the arena as was his custom, he let him stand saddled in the barn aisle while he had to take care of something in the barn. After about 15 or 20 minutes of standing there saddled, Chris said he heard "Tex" let out a HUGE breath and then lick and chew. At that moment we knew that he was going severely right-brained introverted. My horse was bipolar! I realized that all the while when I would put the saddle on him and run him through his paces, I was treating him as a left-brained dominant horse. I treated him like he didn't want to do what I asked. In actuality, he wasn't saying "I won't", he was saying "I can't"! I was so wrapped up in my false presumptions that I failed to listen to what he was trying to tell me for 5 LONG YEARS!! Of course in my defense the Parelli Horseanalities weren't released until 2006, but still, I felt absolutely horrible that it took me so long to realize that I was causing the problem and magnifying it a hundredfold by using the wrong strategy with him! Chris sent him home with me to let him make friends with the saddle in his own time. He felt that "Tex" would do better if we just put the saddle on him and let him "hang out" with it so to speak. I spent that entire summer armed with my new found knowledge of what was motivating the explosive bucking and a new strategy to deal with it. Each day started out with saddling "Tex" very slowly. After each step of the saddling process I waited until he relaxed and licked and chewed. Sometimes it would take him 5 minutes or more! But each time it came faster and faster. After the saddle was on and tightened sufficiently, I fed him and left him in the pasture for a good hour or two. Then I would take the saddle off and let him alone. As he got more confident with that, we added dragging ropes, progressed to tarps (all with the saddle on) and increased the level of difficulty over time. This became our routine. I had him drag anything I could find out in the pasture. We had a bunch of trees that had been taken out by a tornado. My husband cut them up and "Tex" and I drug them to the burn pile. This was his job. I tied extra ropes to his saddle and sent him to the log or tree branch we needed to move. I would have him sniff it, then I would tie the rope around it. At first I pulled it myself, dragging it in front of him as he followed, then moved it beside and then behind him. Gradually I would have him change directions so that the rope would touch his hip, his legs, go over his rump and drag on the opposite side. Eventually he got to where I could wrap the line around the saddle horn and he would do the work. He really seemed to enjoy his job. It's exactly what he needed. A purpose. Over time, his confidence grew and I started to see the old "Tex" return. The one that was present during our on-line and liberty sessions. I began to learn his body language as he would reach a threshold. When he would hit that spot, instead of pushing him through it like I used to, I learned that if I just gave him a minute to think about it and let him figure things out on his own terms, he would let out a breath and then we could move on without incident. Whenever he was in an unfamiliar situation or place, all I needed to do was put him on our familiar pattern of find something to drag and he would immediately settle. It was not long after that I was introduced to Dale Kahl through Christi Rains, my Parelli Instructor. He offered to help me get "Tex" going again so he could be ridden safely. After having been bucked off and injured the winter of 2006, I was harboring a great fear of riding him and he needed an experienced rider/trainer to help him build his own confidence with a rider. Dale did a wonderful job with him, and after over 6 years from the start of our journey together, I finally got to ride "Tex" at our first ever clinic and go on a trail ride at Christi's Trail Confidence Clinic in 2011. I felt completely safe with him. He was such a pro and there was no sign of the right-brained crazy horse that used to show up when the saddle was put on. I realized that "Tex" was going to need a real job and to be ridden nearly every day, which I knew I couldn't give him. I was Blessed to find an amazing home for him through Bob Byrns, head of Parson's Mounted Cavalry at Texas A & M. He had mentioned they were looking for some horses for their unit and told me what their requirements where. Deep in my heart I knew this was the place for "Tex". After an evaluation period and thorough vet check, "Tex" was accepted into their program as a cavalry horse in January 2012. He's doing quite well and attended his first big parade at the Houston Stock Show in 2012. Who would have thought that the bucking bronc would make an awesome parade horse! Looking back I would probably do things a lot differently, but I do not regret one bit the experience and tremendous learning opportunities that "Tex" and his little orphaned brother "Spirit" have brought to me. Because of these two horses I found my true passion and they put me on the path to meeting people who would completely change and enrich my life. 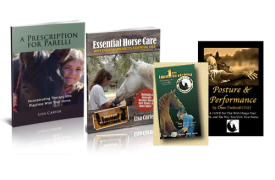 Without them I may never have become involved in Parelli as fully as I did or have learned so much about the importance of understanding horseanalities in dealing with horses with regard to training and in my work as an equine massage therapist. Because of them I am a better horsewoman than I ever could have become on my own. Have you ever had a serendipity moment? 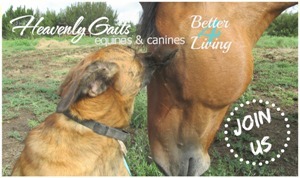 Come over to my Facebook page and share: http://www.facebook.com/HeavenlyGaitsEquineMassage.